This is another edition of EMSCEP Radio, from our on-location coverage of the Fairfax Fire Rescue EMS Week Training Symposium, during EMS Week. In this episode, we talk to Brandon King about LVAD devices. In EMS we tend to think of them as a temporary solution and expect patients to potentially be pulseless. Brandon will have some new data about growth of the devices, and some newer pulsed technology. Brandon is a member of MedSTAR Transport where he has been a Flight Nurse since 2012. 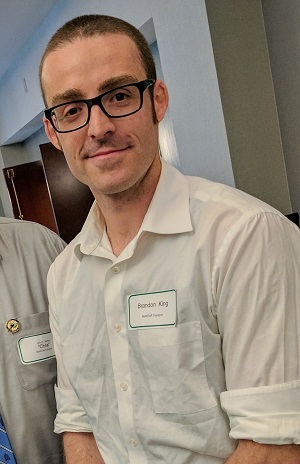 Prior to flight, Brandon gained his experiencing working in both the Cardiac Surgical ICU and Cardiovascular Recovery Room at MedSTAR Washington Hospital Center. During this time, Brandon focused on caring for patients in the Advanced Heart Failure Clinic, as well as rotations through MedSTAR Trauma. The MedSTAR Trauma unit serves as the designated intake center for Long Term Mechanical Circulatory Support (MCS) patients in extremis. Brandon’s experience in MCS education includes in house patient/family device teaching, local Emergency Medical Support, outpatient dialysis and community hospitals. Brandon serves as adjunct faculty for the Left Ventricular Assist Device (LVAD) education program at MedSTAR Washington Hospital Center. When Brandon is not caring for patients in a helicopter- he is a husband, a father, and he enjoys the outdoors. His hobbies are running, rock climbing, and cycling.